Mass and energy act on space-time like a rock thrown into a pond: the bigger the rock, the bigger the ripples. 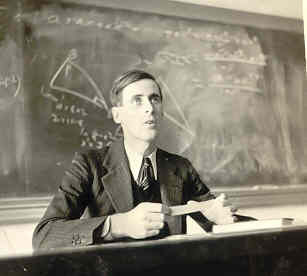 Physicist W.J. 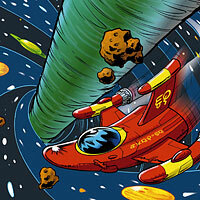 van Stockum realized in 1937 that an immense cylinder spinning at near-light speed will stir space-time as though it were molasses, pulling it along as the cylinder turns. Although Van Stockum himself didn't recognize it, anyone orbiting such a cylinder in the direction of the spin will be caught in the current and, from the perspective of a distant observer, exceed the speed of light. The result: Time flows backward. Circle the cylinder in the other direction with just the right trajectory, and this machine can take you into the future as well. Michio Kaku, in Wired Magazine. Last year (2003) I reviewed some books on time travel for our University news paper. One of these was »How to build a time machine« by Paul Davies. It contains a time line like the one shown here. What struck me was that the time travel pioneers are all listed with their first name, except one: W.J. van Stockum. The book has illustrations of most of these pioneers, but not of Van Stockum. A search of the internet returned many links to Van Stockum's cylinder as the first time machine based on general relativity, but no clue on what "W.J." stood for. Was it a man or a woman? I was curious. The name "Van Stockum" is Dutch, but the article from 1937 in which he (she?) 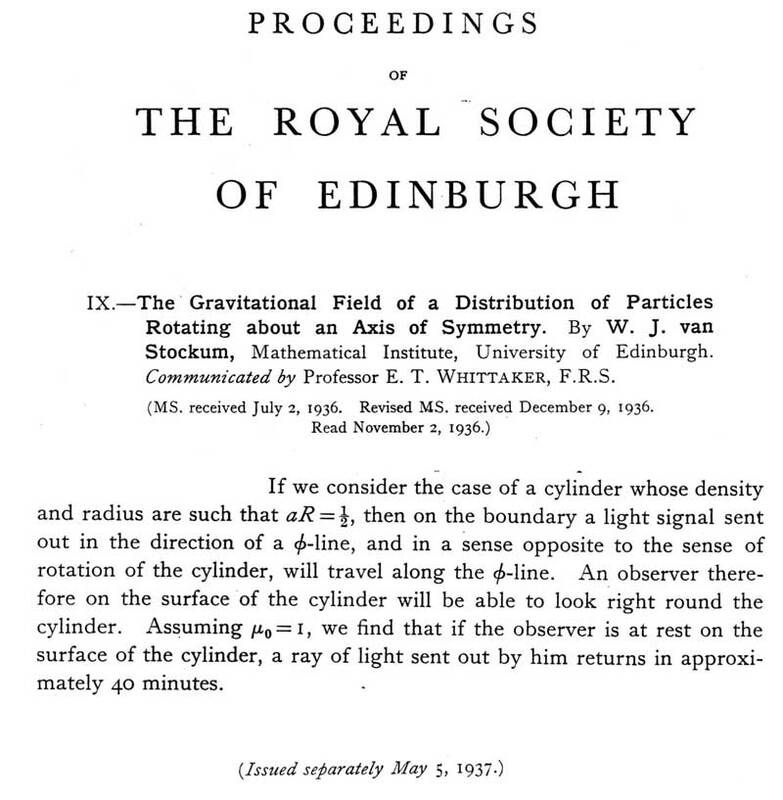 reported the solution of Einstein's equation for a rotating cylinder lists Edinburgh as affiliation. One "Willem Jacob van Stockum" did his Ph.D. in Leiden in 1888, which seemed too early and moreover it was a thesis in the medical school. This could not be our W.J. I gave up and mentioned this little biographical puzzle in my book review. There is only one reason why a man will throw himself into mortal combat and that is because there is nothing else to do and doing nothing is more intolerable than the fear of death. I could stand idly by and see every painting by Rembrandt, Leonardo da Vinci and Michelangelo thrown into a bonfire and feel no more than a deep regret, but throw one small, insignificant Polish urchin on the same bonfire and, by God, I'd pull him out or else. I fight quite simply for that and I cannot see what other reasons there are. At least, I can see there are reasons, but they are not the reasons that motivate me. A soldier's creed by a bomber pilot, Willem Jacob van Stockum (1910-1944). June 10, 1944: Take-off 0030 Melbourne to bomb the airfield. Shot down by flak, crashing at Entrammes (Mayenne) roughly 9 km SE of Laval and some 4 km from the airfield. Flying officer Van Stockum hailed from a Dutch family, his father, Col. A.J. van Stockum, having served in the Royal Netherlands Navy. Van Stockum was a brilliant scholar, having gained a BA and Large Gold Medal from Trinity College Dublin and an MA from Toronto University and a Ph.D. from Edinburgh University. Read more about Willem van Stockum's family. ...or about his career as a pilot.